The team will once again be attending Medica. Medica is the world’s largest medical equipment trade exhibition - and we extend a warm invitation to meet the team and discuss the sale of medical equipment. 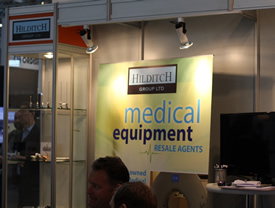 Hilditch Group will be exhibiting in Hall 10, stand G30 from the 14th – 17th November. Please call in and meet us or contact us to arrange a meeting during the show. We will also be hosting a drinks party from 5pm Tuesday 15th – please join us.